This double ring harness adds a second ring vertically to draw a line down your chest. Ideal for men with long torsos. 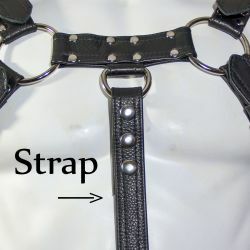 The center portion of this harness has been elongated. This makes the harness not bunch up the pecs on some body types. It's worn tightly with the strap in the center of the chest. The leather straps wrap sensually around your chest and hold you just right in all circumstances. The double rings create a pleasing handle in the center of the chest. Add a matching torso strap for an extreme handle that connects down below. This harness works for larger body types. All genders. Some FTM who have not had top surgery like this harness because it works well with a binder. This harness also makes a daring fashion accessory. Over clothes the grip of leather remains extremely pleasurable. Proper attire at leather events and bars, but welcome in many scenarios. This piece is adjustable with four heavy metal buckles to account for changes in your body over time. We do not charge extra for any size (xxxl, etc...). We make these ourselves, and we want you to love them. Made in Las Vegas, Nevada.